I just got an “Artist Endorsement Deal” from Airline/Eastwood Guitars, which means that i get good prices from their company´s line of guitars:-) They make good guitars at a reasonable price that has a “character”- and that´s become more and more important for me as a player over the years! Born in a small town called Åkrehavn on Karmøy Island on the western part of Norway. Grew up with my guitar, playing in lots of pop and rock coverbands with my mates. After doing Highschool Of Music I moved to Kristiansand in the southern part of Norway to study music further. Got a Bachelors Degree from the Agder Concervatory Of Music, now Agder University, principal instrument Classical Guitar and Baroque Guitar, with teachers Jan E. Pettersen and Per K. Farstad. Carried on for one extra year studying Music Composition and Arranging with teachers Johan V. Ugland and Hans M. Græsvold. Also private studies in Composition with Danish composer Svend Christiansen. Moved to London in 1997 to do a One Year Diploma Course at GIT, MI London/LMS, Electric Guitar studies as well as studies in Jazz/Latin. Tutors Nestor Garcia, Thomas Lang, Ed Speight and Eric Roche ++. Was rewarded “Guitarist Of The Year” same year and got the Platinum Award. Had regular Gigs in “Rock Garden” in Covent Garden with my band and also did gigs around London, at “The Borderline” etc. Moved to Stavanger in 1998 and have been living there since. The first 10 years combinding teaching Guitar and Ensembles at St. Svithun High School Of Music/The Stavanger Culture School with session work. The period 1998-2000 I wrote my guitarbook “Tell Med Meg” – published by Cantando Musikkforlag in 2000. (Tre) Vise Menn, Tone Krohn, Marieke Wang, Randi Tytingvåg, Christel Alsos, Hanne Sørvåg, Gaute Ormåsen, Christina Bjordal, Britt Synnøve Johansen, Sigurd Sele, Venke Knutson, Tommy Fredvang, Glenn Lyse, Ed Speight (Ian Dury and The Blockheads/Mike Oldfield), Eric Roche, Bjørn Fjæstad (Danmark), Mia Gundersen, Kathrine Lunde, Ingrid Kjosavik, Ahn Vuh, Magne “Manna” Høyland, Grethe Svendsen, rap-artist Atlars, Jan I. Toft Band, Jahn Teigen, Espen Hana, Torfinn Nag, Benedikte Kyvik, Jannice Kruse, Rønnaug Foss Alsvik, operasinger Kjell M. Sandve, Stavanger Symphony Orchestra, Elin Furubotn, Leif & Kompisane, Elisabeth Moberg, comedian Dag Screiner and writer/composer/pianist Ketil Bjørnstad. Currently I´m working on my debut CD, hoping to be able to release it within 2013. 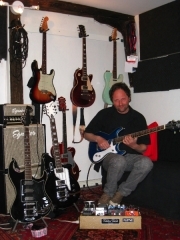 This is a record of songs I´ve written during the past decade, instrumental music, in a jazz tradition, and the recording is done in my own studio, the KompisStudio, located in the city centre of Stavanger. You can have a quick listen to some of these songs as well as others I´ve written through the years on the MP3player to your right! Also, here you can check out a couple of the artist´s/recordings i´ve contribute on in the past – if you want to check out my playing etc.